Kathryn's Report: Are you safer if you fly on a private jet than a commercial airplane? Are you safer if you fly on a private jet than a commercial airplane? No airport security lines. No time-consuming transfers at hubs. And no unruly kids kicking your seat back. Business jet travel is certainly more efficient and glamorous than flying commercial. But is it as safe? The accident rate for corporate aviation is hard to determine, but studies show a higher accident risk in taking a business jet over a commercial airliner, though both are considered extremely safe. In 2015, the last year for which the National Transportation Safety Board has figures, the accident rate was 11.85 per million miles flown in business-size planes compared with one per million miles for regularly scheduled commercial airline flights. Last year, there were five fatal business-jet accidents in the U.S. and four in other countries, according to Aviation International News. In contrast, there were no fatalities on commercial airlines in what was the safest year ever for commercial aviation. The Courier Journal examined the safety of business jet travel in the wake of Friday’s crash that killed architect Wayne Estopinal and two others when the Cessna 525A owned by Estopinal’s company crashed shortly after takeoff from Clark Regional Airport. Safety records show the same model of light jet has been involved in a dozen accidents since 2004, but only one involved fatalities. In that accident, four people were killed in Santa Monica, California, on Sept. 29, 2013. The NTSB determined the pilot failed to decrease speed as he was landing. The plane veered off the runway, crashed into a hangar and bust into flames. The NTSB said a large dog was on board, along with other unrestrained animals that had the potential to create a distraction during the landing roll. Only one of the accidents involved a mechanical problem — a brake failure on landing attributed to fatigue cracks in old hydraulic lines. All others were attributed to pilot error. Estopinal's company plane was built in 2009. A former TEG pilot said the company bought the plane new, and it was configured to seat seven passengers. The Cessna Citation 525 has been a workhorse of the business aviation industry, with about 2,000 sold between first delivery in 1993 and June 2017, according to Cessna. Among all models in the 525 series, there have been 49 accidents — 12 with fatalities, including the one in Santa Monica, according to the NTSB's aviation database. Thirty-four people died in total. Most of the fatal accidents involved the original model, which had a significantly smaller wingspan and fuselage than TEG's late-model 525A. None of the accidents was attributed to mechanical problems. In one crash, the pilot deliberately flew into his own house in Utah after his arrest on a domestic violence charge. He died, but his wife and son — his intended victims — escaped the burning house. In one of the accidents, a Cessna Citation crashed into a smaller plane on the runway, killing passengers of the other plane. In another, an unlocked door to the nose baggage compartment came open during takeoff and the pilot stalled and crashed while trying to return to the airport to close it. The NTSB noted several other instances where Citation doors came open but pilots were able to safely return to the airport. In three accidents, pilots became disoriented and crashed during instrument flight. In the most recent accident, on April 16, a private pilot took off on a personal flight from Richmond, Virginia, and crashed 19 minutes later. The NTSB has yet to determine a probable cause. JetAdvisors.com, an aircraft broker in Bedford, Massachusetts, describes the Cessna 525A as “extremely easy to fly'' and says it can be flown with one pilot, making it more cost-effective than planes requiring two. Estopinal, the founder of Louisville City FC, was a licensed private pilot who flew his own small plane but wasn't rated to fly his company's jet. Estopinal's company, TEG Architects, had two pilots on staff. TEG pilot Andrew Davis, 32, died in the crash. The Federal Aviation Administration said Monday that his record was free of accidents, incidents or enforcement actions. Also killed was passenger Sandra Holland Johnson, 54, a TEG vice president based in Shreveport, Louisiana. The cause of the crash shortly after takeoff from the Clark Regional Airport remains under investigation. 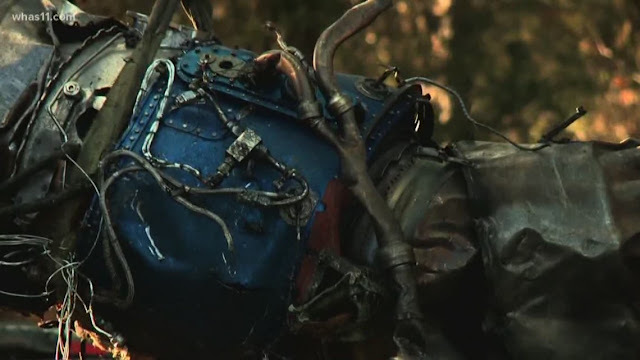 Workers Monday were hauling parts of the demolished plane from a densely wooded area west of unincorporated Memphis, about 16 miles north of Louisville. Because business jets can be registered in multiple categories — some as general aviation aircraft, while others are listed as aircraft for hire — accident rate comparisons are difficult. In 2014, Time magazine reported that private jet travel is slightly riskier than going commercial, but Bloomberg reported the next year that since 2000 there had been five times more fatal accidents in the U.S. involving private and chartered corporate planes than commercial airliners. Based on a review of hundreds of investigative reports and news accounts, Bloomberg said pilot error was cited in 88 percent of business aircraft crashes. The news outlet said investigations found that pilots of private and chartered corporate planes worked long days, skipped safety checks and overlooked hazards such as icing on the wings. It also said business jets and corporate pilots were not regulated as closely as those in the commercial sector. Dan Hubbard, a spokesman for the National Business Aviation Association, which promotes the business jet industry, said its data, which is several years old, show the accident rate and fatality rate for corporate-designated flights with two pilots equals that of commercial airlines. He said the Bloomberg report included all business flights, including those using single-engine planes that are more dangerous. In one of the most highly publicized business jet crashes, PGA golfer Payne Stewart and six others died in 1999 when a chartered Learjet 35 crashed into a field near Aberdeen, South Dakota. The NTSB said the two pilots lost consciousness because of a loss of cabin pressure, though the cause of the failure was never determined. The plane flew for four hours after air traffic controllers lost contact with the crew and eventually crashed after running out of fuel. – Lewis Katz, a former owner of the NBA’s New Jersey Nets and the NHL’s New Jersey Devils, and six others died in 2014 when his Gulfstream IV exploded on a runway near Boston. The NTSB cited pilot error, finding that the pilots mistakenly kept locks on the aircraft, designed to keep it parked, engaged when they tried to take off. The plane crashed into a ravine and burst into flames. The agency found that accident would have been averted if the crew had performed preflight checks. – Christophe de Margerie, CEO of French oil giant Total, and three crew members were killed in 2014 when his private jet hit a snowplow while taking off in Moscow. News reports said the snowplow driver was drunk. He and a duty engineer later pleaded guilty to causing the deaths. – Dr. Steven Roth, a heart surgeon, and four of his staff were killed in 2013 in a crash on landing in Thomson, Georgia, that the NTSB blamed in part on the pilot's fatigue and unfamiliarity with the Beechcraft 390 premier. The pilot and co-pilot both survived. The NTSB said the pilot, who crashed into a pole near the runway, had tried to sleep the night before in Nashville, but cellphone records showed his longest break between calls and texts was 65 minutes. "As a result, five people died who did not have to," said NTSB acting chairman Christopher Hart. "Just as pilots should not take off without enough fuel, they should not operate an aircraft without enough rest." – In 2001, a private jet crashed at night while trying to land in Aspen, Colorado, killing all 18 on board. The Gulfstream III jet, operated by Avjet Corp., had been chartered to take 15 people from Southern California to a birthday party in the ski resort. The NTSB noted that several other pilots had diverted because of stormy conditions but the man who chartered the plane grew "irate" at the idea and pressured the pilot to land, despite limited visibility and a nighttime curfew. Both are extremely safe and safety is always number 1 concern for both. But, but, but ... more fatalities have occurred on scheduled commercial flights than on both charter and private jets in the past 20 years. There are 86,000 commercial flights a day in the United States. According to the FAA there are roughly 360,000 business jet flights per month. The airlines serve 400 airports. Business aircraft serve 6,000. Business aviation employs more than 2 million people in the US and generates more than $300 Billion of economic activity annually. S&P 500 companies that use business aviation outperform those that don't by 80% in financial performance. Airline training is much more challenging from the standpoint of time allotted to complete the training/Type Rating. That said, there is a very high percentage of retired airline / air line (depending upon the carrier) pilots that fly corporate, Part 135 and/or privately. So, one can deduce the reasoning regarding safety. Air Carrier travel is much safer, in my opinion, regarding flight deck operations from one major factor, single pilot vs crew environment. Why is it that all high-profile private operators insurance require two pilots on a single pilot aircraft? When will the FAA wake up and not allow single pilot jet type ratings and operations?